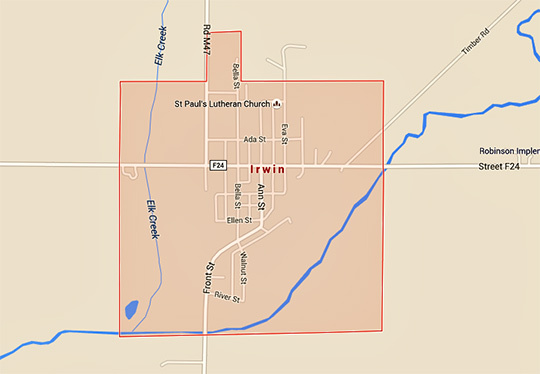 In May of 2006, PRISM was contacted by a family that was experiencing paranormal phenomena in their Irwin, Iowa home. The owners described the paranormal activity as - hearing unexplained sounds and witnessing ghostly apparitions at night. They believed that the house was haunted by the spirits of both a male soldier and a young girl. PRISM investigators present for this preliminary investigation included David Pierce Rodriguez, Carl Norgard, Dottie Norgard, Kelley Norgard, and Larry "Bo" Kennedy. The family was interviewed and baseline EMF readings, photos, and audio were taken. On the evening of June 10, 2006, PRISM conducted an overnight paranormal investigation at the residence. There were absolutely no young children present in the house during the investigation. The following are four Electronic Voice Phenomena (EVP) recorded in the house by the PRISM team that night. PRISM investigators present for this preliminary investigation included David Pierce Rodriguez, Carl Norgard, Dottie Norgard, Kelley Norgard, Larry "Bo" Kennedy, Karen Copeland, Anney Horn, Dan Christianson, and John Shrimpton. Several EVP and interesting photos were captured in the house.